Synopsis: Billy (Vaughn) and Nick (Wilson) are successful watch salesmen who suddenly lose their jobs when their company goes under. Stuck with the prospect of only ever being salesmen, they take a chance at earning a spot in Google's internship program, where they must team up with other outcasts in the program to win full-time jobs at the famous company. Andrew: Hello readers! 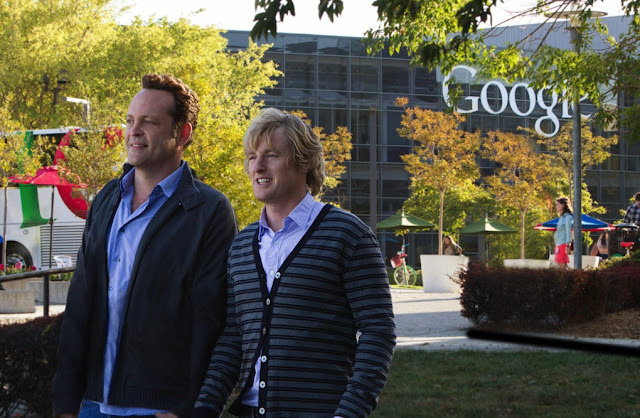 A few weeks ago Sarah and I were able to catch an advance screening of the new Vince Vaughn/Owen Wilson comedy The Internship, where they play a pair of salesmen/best friends named Billy and Nick, respectively, who lose their jobs selling watches. Seeing as they have no real work skills they take a chance at getting an internship at Google; kind of an odd premise but we’ll get to that in a little bit. This was one that I, personally, was looking forward to – what about you? Sarah: I thought it was one that looked cute. It’s not one I was dying to see in theatres, I could have took it or left it as far as seeing it on the big screen or not. But I must say I’m glad that we did see it, because it turned out to be pretty cute! It turned out to be pretty funny and it had a lot of surprisingly heartfelt moments, good actors…it was just a fun movie. What did you think? S: Wedding Crashers, a movie that we love. A: Exactly, so I was looking forward to that same chemistry between the two leads, and it did not disappoint. They pick up right where they left off, and this basically could’ve been a spin-off of Wedding Crashers. Their characters were very similar here as they were 9 years ago, but they’re basically just playing Vince Vaughn and Owen Wilson. I’m fine with that; they work well together. I actually think they strength of the movie lies with the rest of the cast! S: The supporting characters, all the young kids, yeah. 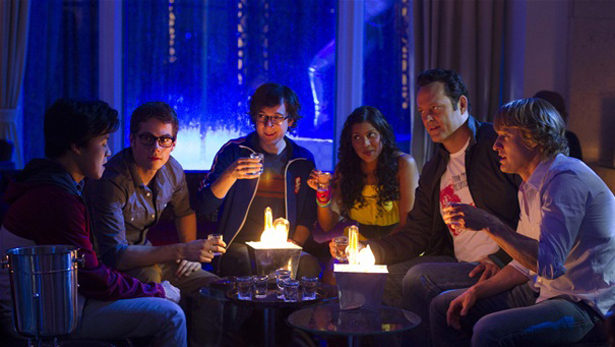 A: The younger actors - Josh Brener (the guy from that Samsung Galaxy commercial they used to play before movies), Dylan O’Brien, Tiya Sircar and Tobit Raphael – who play some of the other interns. Because the interns in this movie all split up into different teams plus a mentor, so all those actors who comprised the rest of Billy and Nick’s group were really funny in their own ways. of relative unknowns who play well against the bigger stars. S: Oh yeah, he was pretty funny as their immediate supervisor. S: John Goodman (Argo) as their former boss at the watch company, he was funny in his small role. A: Rob Riggle plays a fellow salesman, and a vulgar one at that, he steals the scenes he’s in; and then I really liked seeing Josh Gad in a small but important role. More importantly, and they kept this under wraps and still have so far, there is a very prominent actor/comedian who has a fairly large uncredited role. You could obviously look up who we’re talking about on IMDb but that would sort of ruin the fun of it. S: What I liked about this cameo was that it was relatively early in the movie, we were still kind of settling in to our seats and so it caught us off guard. It was well done. I think while we were watching this movie that I kept thinking early on, “If this keeps hitting the same kind of notes as Wedding Crashers then this will be pretty good,” and it didn’t disappoint. It was funny, I thought it was a really good script actually, a smart script. A: Vince Vaughn actually co-wrote the screenplay. S: Yeah! And he did a good job! He writes well for himself, I think he knows his abilities and he plays to his strengths. He plays a good Vince Vaughn, which is the guy who struggles a bit but makes good at the end. That’s kind of his M.O. A: Something I liked is that Vaughn also came up with the story. He didn’t just co-write the screenplay, it’s actually his story that he came up with. He kind of came up with it during the job crisis that hit America a few years back, it was something that inspired him to come up with a story of these guys that lose their jobs and take a chance on something new. So I thought that was pretty neat. S: Taking place at Google, right. They do a really good job of mixing exterior shots of the real Google campus with interior shots done on the campus of Georgia Tech in Atlanta. They did a good job of seamlessly interconnecting the two. You know, this movie is silly and it’s a fun, college humor type of film, and I thought it was fitting to take place on these campuses. A: The plot isn’t something that you really want to think about too much, but it did strike me as a little odd that all these interns at Google are basically forced to compete with one another in games and exercises to see who will win full-time jobs. I highly doubt that that’s what it’s like at Google, but it made for a different take on this kind of film. in well with other exterios/interiors shot in Atlanta. S: Which was actually kind of weird and super-dorky but awesome at the same time. S: I did, too, I felt like we got to know some of the supporting characters a little bit better with that whole scene. A: But as I was saying to you as we left the theatre, I just love watching Vince Vaughn and Owen Wilson together. I could have watched the two of them, plus this particular group of characters, forever. I really, really enjoyed the main characters in this movie. S: They all just had a great chemistry. It’s funny, because I see Vince Vaughn movie or an Owen Wilson movie where they’re off on their own and I feel like something’s missing. I think they just work well together, especially with their quips they send back and forth. So they do really well and I think they (unrealistically) they should do nothing but movies together, because I don’t find them very good on their own. But together they just make a great team. The Internship was just funny, it was a good, classic funny movie where you feel good to be at the movie theatre laughing with everybody else. A: Yeah, they’re not reinventing the wheel, but this is certainly in their wheelhouse and they’re very good at this particular kind of comedy. A: But I think it’s one that a lot of the family can enjoy together. S: I liked him, too! I liked him so much here that it actually made me want to go home and watch The Social Network. A: Agreed, and not that I wasn’t already, but it got me even more jazzed to see the upcoming movie adaptation of one of my favorite novels, a horror novel called “Horns” written by Joe Hill (who happens to be Stephen King’s son), and Minghella plays the antagonist of the story. I think he’s going to be perfect for it based off of what we saw from him in this film. 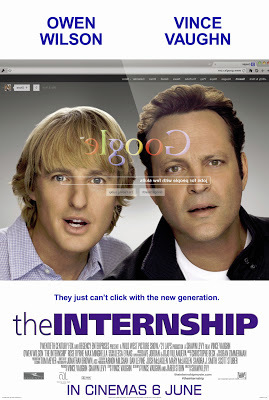 So that was just another thing I really liked about The Internship. I actually wouldn’t mind owning this someday. S: Me neither. I think it would fit in nicely with our Wedding Crashers repertoire. S: Yeah, you laughed a lot. It was really funny. A: It tickled my funny bone. S: Sometimes you just need a movie like that, and this was one of them. A: Anything you want to add? S: Um…I did think the love relationship between Owen Wilson and Rose Byrnes’ characters was a little tough to believe. But you know, you gotta throw that in there. A: I liked it, I liked the chemistry between the two of them. S: It was funny. She’s a funny actress. A: Last question: did you feel like this movie was just one big promotion for Google? I’ve been reading some backlash on it saying things like just “gross product placement” or “a two-hour infomercial” for Google. Did you feel that at all? S: Not at all. I mean, it’s freaking Google! Do they really need the publicity that bad? Of course not. I saw it as a couple of guys who were out of work taking a chance on something way out of their element. A: Me too, I saw it as a fish out of water kind of comedy. I did think there was some product placement for the Android phone operating system, but not once did I go, “Wow, I wish they’d stop pushing Google in my face.” We already use it a million times a day. C’mon. S: Okay, let’s wrap this up. A: If you like Vince Vaughn and Owen Wilson, you’re probably going to like this. It’s 100% their kind of humor. Like we said earlier, these guys are basically just doppelgangers of their Wedding Crashers characters. It actually makes you long for a Wedding Crashers 2, but not in a bad way. It’s probably the next best thing. S: I agree, and like I said before it’s just a fun time to be in a movie theatre, especially a packed one. And I’m not normally a fan of that. FINAL VERDICT: A good way to kill a Saturday afternoon!